Mushu is a whale who is cared for by the whale biologist and people are allowed to swim with him although they are not allowed to feed him. He also does shows for an audience. He once ate Amy's watch which Kif later obtained again by getting Leela to hide rotten fish under her swimsuit and feeding it to Mushu. During his next show, Mushu vomited the watch out along with ambergris. 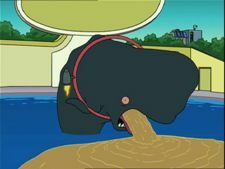 According to the commentary Mushu was dumped into the sewers in "Leela's Homeworld" by Bender. He does throw a whale away into the sewers but that can't be Mushu since she didn't appear for fourteen more episodes, and since that whale is a completely different type of whale (probably an orca). Mushu is also the name of the little dragon from Disney's Mulan. According to Roseanne, ambergris is used as a base in the finest perfumes. This page was last edited on 24 September 2013, at 21:39.